GAA is hosting a fundraising day for Beatson Cancer Charity. We are all affected by cancer in some way and we want to do our bit to help those in Glasgow going through treatment. On 29th Saturday 29th September 1pm-4pm, come along to GAA for a fun day! We have some brilliant raffle prizes, fun games, bake sale, face paint, glitter tattoos and a whole lot of fun! Lucy Herning (GAA student) will be getting her hair cut to donate. So dig deep for this brilliant cause, bake some cakes, donate some prizes and most importantly - come along! 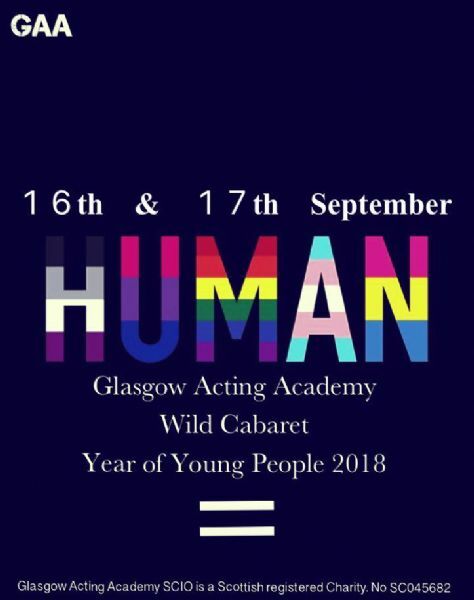 Glasgow Acting Academy's senior musical theatre students will perform 'Human' as their cabaret on 16th and 17th September at The Wild Cabaret in Merchant City. Last year was a sell out so get your tickets quick for this event. Tickets can be purchased from the GAA office. For more information call 0141 237 7140. Parents and Families of GAA, round up your best team of brainiacs because it's time for Glasgow Acting Academy's Big Pub Quiz!On Friday 10th August come along to Glasgow Acting Academy for a night of quiz rounds, interactive games, karaoke and prizes!Doors open 6:30pm for a 7pm quiz start! This is a B.Y.O.B event so no under 18's allowed. £5 per person entry (including mixers and nibbles). Teams of no more than 5 people please!Tickets for this event are available from the office! If you are interested please like and comment! We can't wait to see you there!